SERPs Redesigned By Google - Have You Noticed Any Changes? Google has announced they are to change the layout of their search engine results pages, with a redesign, in order to simplify searches for Google users. The recent renovation has meant that search options such as the usual Web, Images and Maps have moved from their usual position (on the left of the page) to directly under the search box. Within the list, the search tools are now displayed within a drop down menu, allowing users to select search filters including; location, date range, sites with images, pages from the UK and many more. The new design has been referred to as a “simpler, cleaner design” by Jon Wiley, Google Search’s head designer. He went on to explain that the new design has enabled more breathing space – providing a better, more focused response to the answer Google users are looking for. Google’s new SERPs interface is now consistent amongst tablets and mobile phones too. Google SERPs To Face Further Changes? The relocation of the search options – now placed above the results – has helped to encourage further interaction with the Knowledge Graph, according to Jon Wiley. This small, yet powerful new interface reverberates a previous change that Google ultimately decided against. 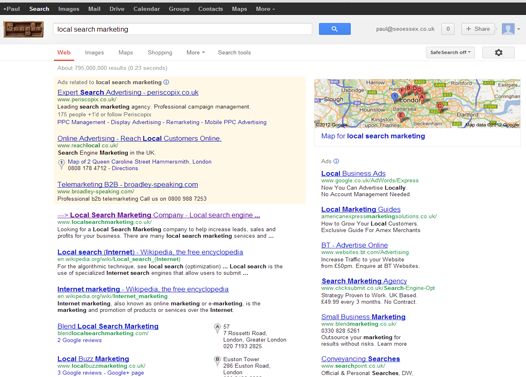 Initially, there was talk of Google altering the black toolbar at the top of the SERPs into a large drop-down menu. Yet based on customer feedback, this change never went ahead. In case you are not familiar – the black tool bar consists of all Google’s services – including; Gmail, Maps, Play, Images, YouTube, Google+ and more. Here at SEO Essex, we feel Google’s SERPs have changed for the better and are almost alien when compared to their appearance 15 years ago. With a clear focus on streamlining and improving the user experience, Google have certainly got the right idea, which is proven with their focus on the Knowledge Graph – something that is yet to become a fruitful facility.